Samuel Johnson's life covers many points, but it's a story about overcoming considerable adversity, to ultimately become one of the best known men of his age. Johnson was born in Lichfield, England, on September 18, 1709; his father Michael was a bookseller. Johnson was not a healthy infant, and there was considerable question as to whether he would survive: he was baptized almost immediately. Johnson was scarred from scrofula, and suffered a loss of hearing and was blind in one eye, thanks largely to nursing from a tubercular nursemaid. During his toddler years, he had an open "issue" in his arm, to drain fluids. Stop for a moment, and think about a small child being singled out in this way, and what it must have meant. The availability of the books in his father's shop, and his natural proclivity for learning, contributed to his having extensive knowledge at an early age. When Johnson spent time with an elder cousin, he was exposed to a broad range of thinking and cultivation, of the sort he wouldn't have ordinarily seen in Lichfield. He later attended Oxford for about a year, but left for financial reasons. His poverty at Oxford was noticed by another student, who left a pair of new shoes outside Johnson's door during the night; while Johnson's poverty was itself humiliating, the fact that another would notice and make Johnson a beneficiary of charity enraged him. So Johnson had to leave Oxford; it must have been a horrible disappointment to someone who was so learned, to leave for financial reasons, and see his academic inferiors succeed in an arena where he couldn't. During this period he went into a severe depression; his friend Edmund Hector helped him remain productive, in spite of the depression. In 1735, Johnson married Elizabeth "Tetty" Porter, a woman several years older than him: she was 46, and he 25. Johnson obtained some notice with his works London (1738) and The Vanity of Human Wishes (1749) — both of which are considered great poems — but his efforts in the 1750's are part of why he's considered a titan. This decade saw the creation of his Dictionary (1755), his Rambler essays (1750-52), his Idler essays (1758-60), and Rasselas, Prince of Abyssinia (1759). This was a trying decade for him: his wife died in 1752 and she was often on his mind. Johnson received a government pension in 1762. The funds were a significant help, and the periods where he was threatened with debtor's prison were put behind him. 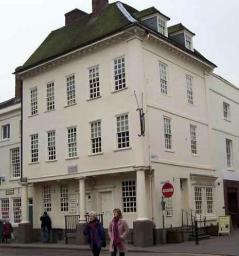 Shortly after this period, Johnson met a young Scot named James Boswell (in 1763) in Thomas Davies bookstore in London. The two became fast friends. Boswell took notes of their conversations, and leveraged those notes and other material into the mammoth, landmark biography "The Life of Samuel Johnson." Johnson's output included far more than just his output of the 1750's, of course. It also includes a complete edition of Shakespeare; a number of frequently cited political tracts; sermons; a description of his 1773 tour to Scotland with Boswell, with considerable discussion of the change of an era; and a series of biographies of numerous British poets (The Lives of the Poets), commissioned to accompany reprints of each poet's works. 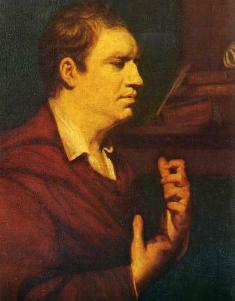 Johnson died on December 13, 1784 and received a burial in Westminster Abbey. Boswell's biography was published in 1791. Boswell's biography, by the way, was not the first, nor was it the last; it is, however, a popular place to start. Johnson (played by Robbie Coltrane) was featured in the third series of Blackadder (in the episode titled 'Ink and Incapability'), presenting his dictionary to idiot Prince George for his patronage, whereupon it is believed to be burnt by the servant Baldrick; Blackadder then attempts to rewrite the entire thing in one night, out of fear of Johnson and his companions.